` Ang Geck Geck: heyadonia! heyadonia.com is an upcoming fashion online store that brings you affordably trendy apparels that keep you ahead of style! Ranging from staple collection to runway pieces, Hey Adonia has gone all ways to source out the best items just for you. Stay tuned to our bi-weekly launch and you will defintely be spoilt for choice. 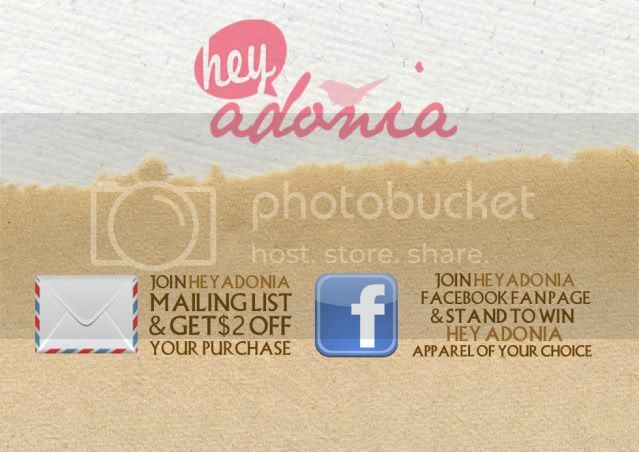 Bringing you more rewarding deals to shop at Hey Adonia by joining Hey Adonia mailing list and get $2 off your purchase! Oh, so what are you waiting for!